IDSecurityOnline offers a wide range of ID card printers from all major brands such as Zebra, Fargo, Evolis, Datacard, Magicard and Nisca. ID card printers provide a simple yet affordable way to print all your ID cards and badges on demand. Let us guide you to help you find the right ID card printer for your needs. ID card printers are not like your regular inkjet printer. Most printers are direct-to-card ID card printers but you can also choose retransfer ID card printers. 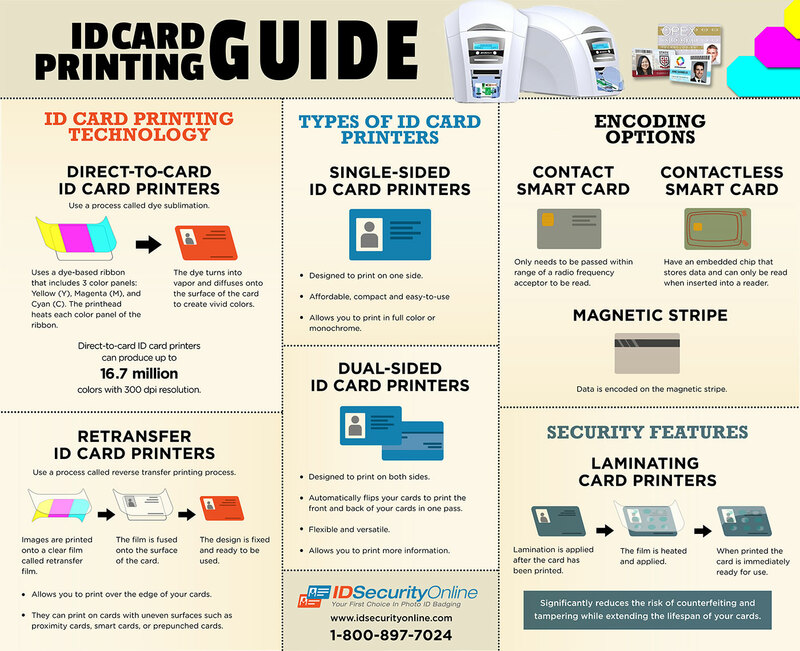 Learn how ID card printers work here. Choosing an ID card printer might look overwhelming, mainly because you have many different types of printers. From single-sided ID card printers to laminating systems, check out what the options are here to make the right decision. We sell ID card printers from all major brands such as Zebra, Fargo, Evolis, Magicard, Datacard and Nisca. Each manufacturer offers specific options so learning more about each company might be helpful. Finding the right ID card printer is easy when you know what to look for. We prepared a detailed checklist to help you make the right decision. Since all printer users and circumstances are different, manufacturers can�t state how many cards their printer is expected to print over its lifetime or how long it will last. The life expectancy of ID card printers can vary widely based on several variables that affect their performance. What�s the Difference Between Overlays and Laminates? During your research into an ID card printing system, you may have come across overlays and laminates that can be added to cards for extra protection and another layer of security. There are 2 major technologies used in ID card printing. Most printers are direct-to-card ID card printers but you can also choose retransfer ID card printers. Use a process called dye sublimation. This process uses a dye-based ribbon that includes 3 color panels: Yellow (Y), Magenta (M), and Cyan (C). When a card in inserted into the printer, the printhead heats each color panel of the ribbon. Because of the heat, the dye turns into vapor and diffuses onto the surface of the card to create vivid colors. Direct-to-card ID card printers can produce up to 16.7 million colors with 300 dpi resolution. Most dye-sublimation ribbons also include a black (K) panel that is a black resin panel used to print barcodes and text in real black. Some ribbons also come with an overlay (O) panel to apply a clear protective layer on your cards. Use a different printing process to print ID cards. The card images are printed onto a clear film called retransfer film that is then fused onto the surface of the card. This process allows you to print "over the edge" of your cards, which means that you won't have a white border around your printed cards. The result is stunning: superb, vivid colors for high-quality badges. Retransfer ID card printers can print on cards with uneven surfaces such as proximity cards, smart cards, or pre-punched cards. Single-sided ID card printers are designed to print on one side of your cards. Affordable, compact and easy-to-use, single-sided ID card printers allow you to print all your cards and badges in full color or monochrome. Dual-sided ID card printers are designed to print on both sides of your cards. A dual-sided printer will automatically flip your cards to print the front and back of your cards in one pass. Flexible and versatile, dual-sided ID card printers allow you to print more information on all your cards and badges. Magnetic stripe ID card printers: choose an ID card printer with a magnetic encoder to print and encode data on cards with a magnetic stripe. Contact Smart card ID card printer: contact Smart cards have an embedded chip that can only be read when inserted into a reader. Card printers with a contact Smart card encoder will allow you to store and read data on these cards. Contactless Smart card ID card printer: these cards do not need to be inserted into a device to be read. To read and store information in the chip, contactless Smart cards only need to be passed within range of a radio frequency acceptor - the range of operation depending on the acceptor but being usually from about 2.5" to 3.9". If you need highly-secure badges, you might consider laminating ID card printers. These printers include a lamination module to add a clear or custom patch or film to your printed cards. Laminating your cards significantly reduces the risk of counterfeiting and tampering while extending the lifespan of your cards. Retransfer ID card printers are the only printers that offer "over the edge" printing for unmatched print quality. Retransfer ID card printers are also widely used to print on uneven surfaces such as proximity cards, smart cards, or pre-punched cards. Choosing the right card printer can be overwhelming. To get a better understanding of what would work for you, answer the following questions. If you are planning to print on one side of a card, choose a single-sided ID card printer. Compact and easy-to-use, single-sided card printers are perfect to print basic visual IDs. Print your logo, the cardholder's name and picture, and even a barcode. If you need to print on both sides, go for a duplex ID card printer. Duplex - or dual-sided - printers will automatically flip your cards to print on both sides in one pass. This option allows you to include more information to your cards such as a schedule for student IDs or contact information for membership cards. Card printers come standard with a USB interface to connect your printer to your computer. However, if several computers need to access your card printer, you will need Ethernet connectivity. Some manufacturers offer USB and Ethernet as standard but some don't, so make sure to select a card printer with Ethernet if needed.